Should I have made the backdrop have more thickness? Had more show of the peeker? Juggling? There’s something wrong with hisarms IMO. It seems that they are too short, especially compared to his forearms. 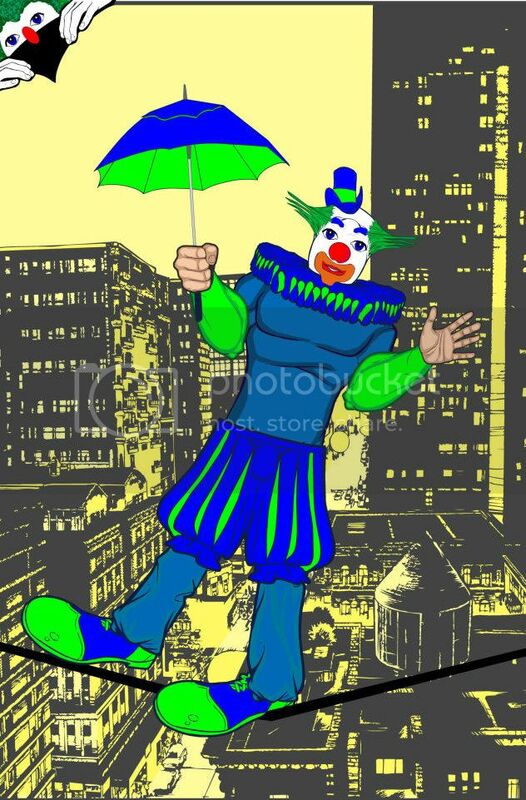 And yes, the background seems to lack in substance compared to the clown. His colors are very vivid, while the town’s are fade, so it seems like he’s real, and it’s not. His forearms are a little too big, I think, overall: in particular, they’re a bit too thick & muscular. He could also use a bigger smile: he *is* a clown, after all. Yes, the “peeker” could be more visible: cute touch, but I might miss it, at its present size. As for the background, what might help would be adding some kind of a pattern of shadow, so that maybe the light highlights him. this might allow you to de-emphasize the background without fading it out. I’m getting a Zero Sized Reply error message when trying to access it. The type of error is intriguing enough to mention. Here’s the finished picture of Sharal. I may or may not digitally add color later. There is a lot of muscle definition on her torso and legs but none on her arms. Not quite sure what is in her left hand. Is that a stone or amulet that generates her energy? Or is that the pad of her paw? If it’s a pad, it’s rather square. Maybe round the corners slightly. There is a lot of muscle definition on her torso and legs but none on her arms.Not quite sure what is in her left hand.Is that a stone or amulet that generates her energy?Or is that the pad of her paw?If it’s a pad, it’s rather square.Maybe round the corners slightly. Really? She’s actually not strictly a warrior, but rather a battlemage, sort of a mixture of fighter and wizard. As such, I wasn’t really trying to emphasize her physical conditioning to be the primary aspect of the picture. 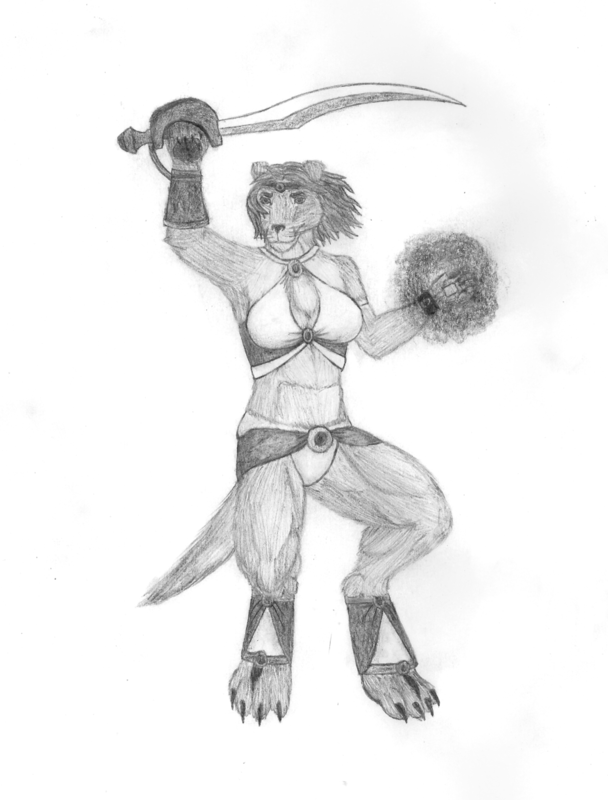 As for the muscle definition, her large legs are more of a racial thing, in that her race, the Poruqe, are known for their disproportionately muscular legs (though the bulk is mostly vestigial; the Poruqe, being a civilized race, don’t need to utilize their leg muscles nearly as much as they used to, but given their tendency toward art and things of beauty, their leg muscles are still somewhat used for things like dancing). As for her torso, the Poruqe are marsupials, to you may have mistaken the pouch for muscle definition. On her left hand, she wears a fingerless glove which has an energy crystal connected to a small copper plate on the palm of the glove. This allows for more efficient transfer of arcane energy toward its target, further aided by said energy crystal, effectively meaning that certain spells cost less arcane energy to use. In case you’re curious, magic in this setting works by having arcane energy (a byproduct of qi reactions in living things) interact with reactions in the brain. Those reactions act as “instructions” somewhat like code in a biological analog computer, which tell the arcane energy to do things. Sharal’s glove is linked to the circlet on her head, which allows a more efficient transfer of arcane energy, as stated above. The energy crystals act as sort of a combination of a “sponge” and a “battery” for ether, which is energy in its purest form. Ambient ether is collected and stored by the energy crystal, and afterward the ether can be accessed and converted into other forms of energy. The energy crystal on Sharal’s glove basically contributes energy to Sharal’s spells, thus allowing her to spend less of her own arcane energy. My comments were strictly about the design. Without knowing the specifics about the race, that’s what I saw. As for the battlemage aspect, again, without knowing the mechanics, that’s what I saw. Now that you have described all that, I see the pouch (the vertical line running up her sternum hints at abs) and the matching jewel on her wristband. Overall, I really like the design. The description makes me even more interested in the character and her adventures. @Jadebrain: I do think color will help portray your intentions a lot better. @Prof: that IS interesting–no idea what it means, though, or how to fix it. @Arioch: Um–the backdrop IS fake. Did you miss the peeker? Nick warned me about that. Arms, huh? I’ll look at those. @Nick: Thank you. You’ve seconded forearms smaller and Arioch, I imagine, PROVES the peeker isn’t big enough. I’ll have to look at maybe a spotlight or something from behind and below the tightrope. Harlequin: Wow. And I’m not a fan of yours. @Harl: Shiki I would say looks like an effeminate male from the nineteen-seventies–the kind that got into fighting when people asked him his gender. Wiry strength. He’ll be as good a fighter as he is ruthless, determined on killing, or angry.